As I mentioned in our COTS NAS buyer's guide last month, Netgear's ReadyNAS OS 6.x is quite interesting because of the choice of a btrfs file system. We also get snapshots with minimal overhead (due to the COW - Copy on Write - nature of the file system) and protection against bit-rot. 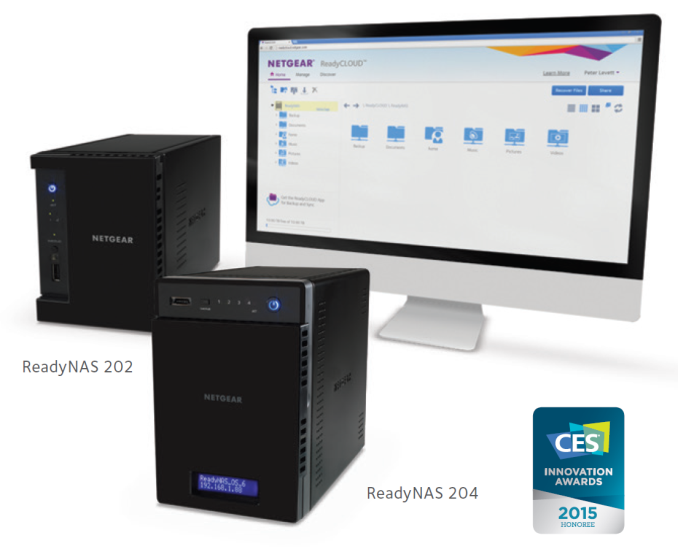 The ReadyNAS 200 series provides a powerful, yet affordable alternative to the ReadyNAS 300 and ReadyNAS 500 series of NAS units. At the show, Netgear also launched the AirCard, a battery-powered 4G hotspot device connecting to the Sprint network. The $200 price also includes 1 GB of data, with the option to purchase more further down the road. In the ProSAFE lineup, we also got Click Switches - 8- and 16- port GbE unmanaged switches with USB charging ports. The focus of the product is on ease of use and versatility. On the powerline networking front, Netgear had their HomePlug AV2 PL1200 and PLP1200 devices on display. 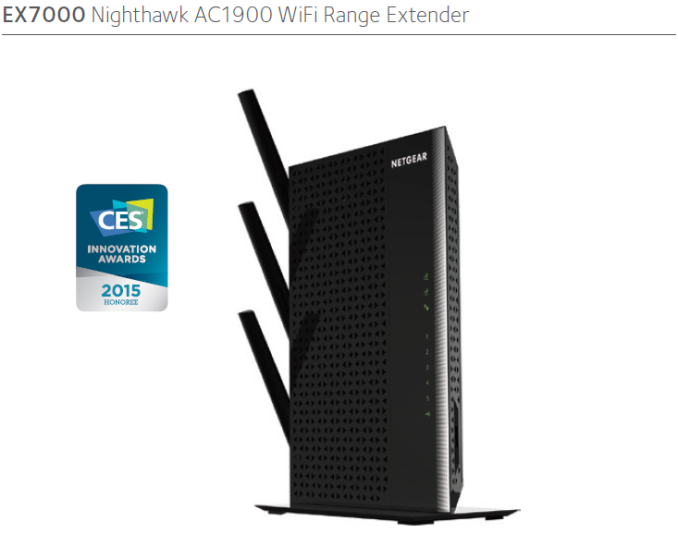 Netgear decided to hold off on any major router announcements at CES. Most of the other networking vendors announcing flagship products were planning to ship in Q2 or later. This obviously points to the hardware platforms not being ready. It does make plenty of sense for Netgear to announce products closer to their release dates. In addition, they got in first on the Broadcom XStream platform with the Nighthawk X6 R8000 and second on the 4x4 MU-MIMO Quantenna solution (after Asus) with the Nighthawk X4 R7500. They have both flagships currently in the market. The focus at CES was more on the software updates (such as ReadyCLOUD integration, configurable power output for the Wi-Fi radios etc.) that Negear had in the pipeline for the R7000 platform. That said, they did show off a Nighthawk AC1900 range extender - basically, the same internal hardware as the R7000, but, without routing support, and priced a good $30 cheaper. Hooray, I get to be the first guy who posts "Bah, I could build a NAS for half that price that would perform better!" But could you get it installed and working, out of the box in just 5-10 minutes like these? Linux's native mdraid do not recompute parity (P/Q) when reading. This is by design: delegating read error detection to drive-integrated ECC only, mdadm can scale read IOPS linearly with drive number (this is due to the other drives being free to serve incoming requests rather than seeking for retrieving parity data). ZFS sits at the opposite extreme: all read data have always their parity recomputed recomputed and checked. This enable very strong error detection, even beyond the drive ECC capabilities, at the cost of IOPS (which are basically fixed and do not increase adding drives to a single ZRAID volume). Interestingly, Netgears's custom BTRFS/mdraid build seems to be somewhat in-between these two approach: at least judging from the above forum post, during normal reads parity is not recomputed (and drives are free to process other requests), but when a read error is found (via BTRFS integrated checksumming), the md layer is asked do recompute the parity for each data block. This try-and-reconstruct scheme is better suited for RAID6 setups, where you have two parity to use for check and reconstruct data. RAID5 with normal (non-checksumming) filesystem you are out of luck (as you don't know if bit rotting happened on data block or parity block), but considering the BTRFS checksumming nature this should be doable.